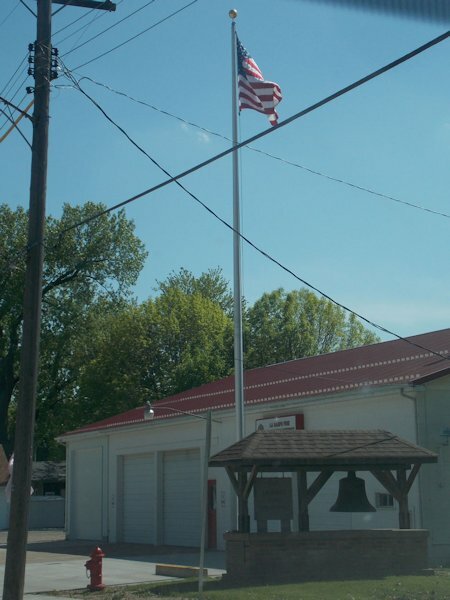 On Saturday, May 17th a 40 foot flagpole was erected at the La Harpe Fire Department. Twelve volunteer fire fighters came to assist in installing the tall structure along with the assistance of Chris Akers Tree Service. Mike Norvil of Ameren IP Electric put a shield on the electric wires. The flag on the massive pole is 6 foot x 10 foot. The cost of the project was $1800 plus the cost of concrete, and made possible due to the generous memorial money left to the fire department.